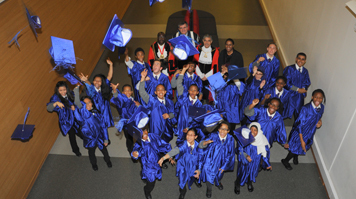 Students from Lambeth Children's University had the chance of a real life graduation ceremony held at London South Bank University (LSBU) this week. Lambeth Children's University aims to reward young people for the time they spend in out-of-hours learning activities. The students are then presented with certificates and awards to mark their participation, followed by a graduation ceremony at the end of the initiative. The programme aims to develop a culture of achievement and lifelong learning from an early age, increasing motivation and helping to support the transition between primary and secondary education. The event was attended by 72 students aged 7-14 from Dunraven School; Francisian Primary School; Hitherfield Primary School and Platanos College. Over the past few months, the children have been gathering credits for their learning hours. Students successfully completing 30, 65 and 100 hours of extra-curricular activities were awarded with Bronze, Silver and Gold Certificates respectively in the formal graduation ceremony. The students had the chance to experience the full academic traditions including wearing robes, mortarboards, also having photographs taken as a permanent reminder of their big day. The students were joined by Chief Executive of the National Children's University, Ger Graus MBE, Mayor of Southwark, Councillor Sunil Chopra and Mayor of Lambeth, Councillor Adedamola Aminu. The certificates were presented by Executive Dean at LSBU, Professor Rao Bhamidimarri. "I am pleased that LSBU has had another opportunity to support the Children's University." Professor Rao Bhamidimarri said. "The enthusiasm and commitment shown by the students is truly inspirational to us all. We hope they are encouraged to continue their studies through to higher education and to strive to realise their full potential as a result of taking part in this fantastic initiative. We will be delighted to see some of the pupils we met this week returning to study with us in the future."